← Jar of cake anyone? 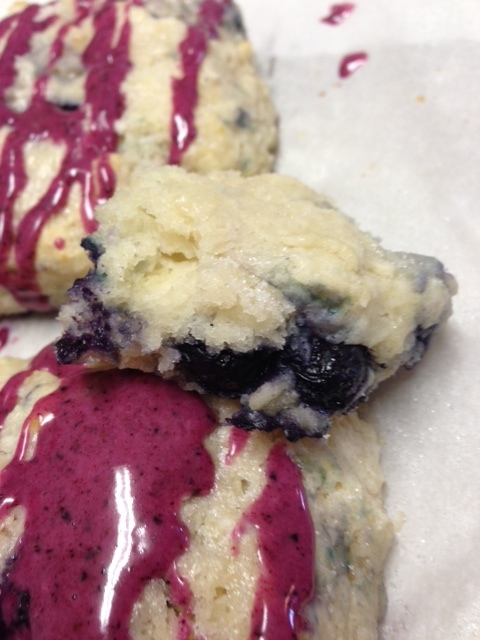 blueberry scones and a cup of coffee…..
What better way to start your day than a warm blueberry scone, drizzled with blueberry glaze. Add a steaming cup of coffee and you’re all set. I love scones……a GOOD scone. I will settle for the ones they sell at that big name coffee shop, but I would rather make my own. The ones in the coffee shops are always dry. I HATE that! The ones pictured here are so moist. I over did it on the butter however, so they didn’t rise as much as they should have. But they are delicious, melt in your mouth, buttery, crumbly scones. 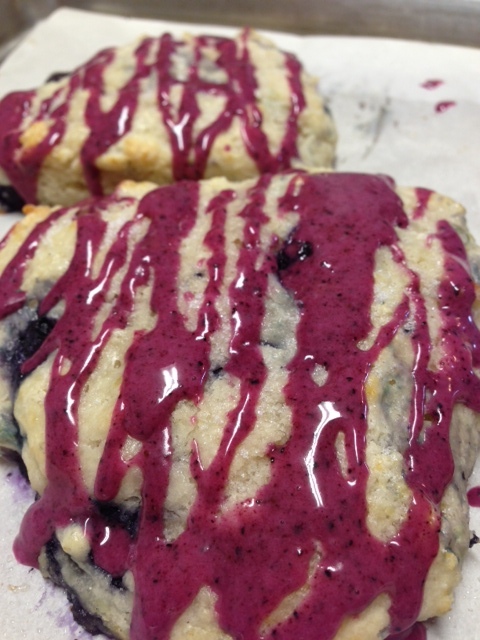 I drizzled them with a blueberry glaze, but you could simply sprinkle them with a course sugar before baking. That is the way that I prefer them. I hope you will try these. Preheat oven to 400 degrees. Put dry ingredients in food processor, pulse to mix. Add butter, pulse until you have big crumbs. Dump into a bowl. Add buttermilk and mix with a fork until a shaggy mass forms. Add a little more buttermilk if necessary to bring the dough together. Form into a disk about 1 1/2 inches high, and cut into 4ths or 8ths. 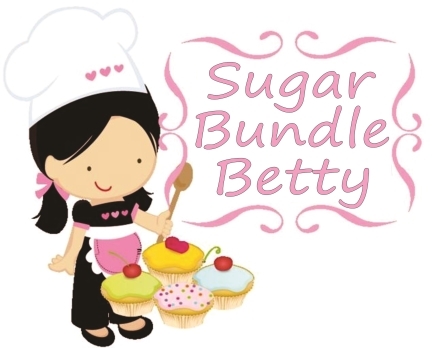 Place on a parchment lined sheet pan and freeze for 20 minutes Remove from freezer, sprinkle with course sugar. Glaze: just a few blueberries in the food processor, with some powdered sugar and a few little sprinkles of water or lemon juice, to get the consistency that you want. Drizzle it on the scones. DELICIOUS.